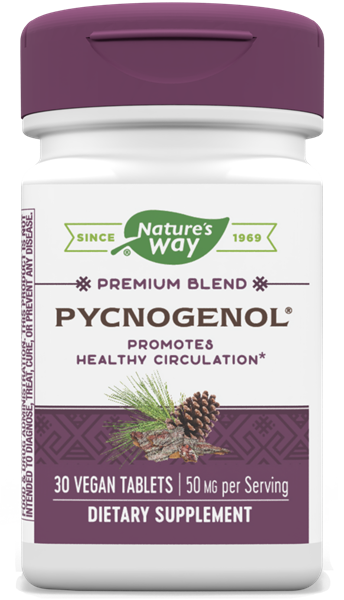 Pycnogenol / 30 Tabs - Nature's Way®. Pycnogenol® is an extract made from the bark of the Maritime Pine. Pycnogenol contains naturally occurring proanthocyanidins, organic acids and other biologically active components. Vitamin E is a powerful antioxidant and a potent free-radical scavenger. Take 1 tablet for each 50-60 pounds of body weight for the first week or two. Thereafter, adjust intake to 1 tablet for each 100-120 pounds of body weight. If pregnant, nursing or taking any medications, consult a healthcare professional before use. Pycnogenol® is the registered trademark of Horphag Research Ltd.